Lynn Melville has touched the hearts and positively impacted the lives of many people caught in relationships with people suffering from Borderline Personality Disorder. ISBN 0976060035, 356 pages. Hard-hitting truths, inspirational and motivational affirmations. Illustrated by Ashleigh Brilliant. See Home Page for more info. 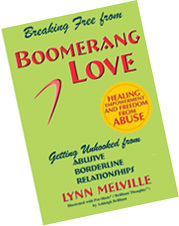 As the second book in the Boomerang Love series, Reality Checks is a collection of many of the powerful, straight talk truths in Melville’s first book, Breaking Free from Boomerang Love – the statements you highlighted yourself as you read the book. This second book is meant to be a companion to the first. This is your emotional first aid kit to carry in your briefcase or purse for quick booster shots of courage and empowerment when depression starts to take you down. It’s the book you reach for when the doubts and uncertainties hit you – when the “woulda, coulda, shoulda’s” begin to weaken your decisions. Buy this book and keep it on hand for a quick dip into its pages to get you back on your path again, feeling confident and rebooted. 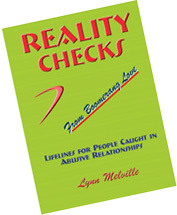 More Info - Receive a free half-hour consultation when you order Lynn's printed book(s).